What are they? Do I need one, and if so, which one? Or, if you already know what you need, click the link below. Every domain hosted by HostedSafe has a cPanel (powered by Comodo) Domain Validated SSL Certificate installed automatically for FREE! These certificates will also auto-renew for free. We have tutorials for our hosting clients to help those with existing websites configure their websites to properly utilise the SSL certificate – to avoid “Insecure Content” browser warnings and to get the Green Lock! We can also do the configuration as an inexpensive service, if needed. For any enquiries about hosting or SSL Certificates put in a ticket via the Support tab. HostedSafe also offer a range of SSL Certificates for those who may require more extensive business or entity validation (the encryption is the same, regardless of type or price). To help with the choice we have put together some FAQ’s to make your decision an informed one. SSL stands for Secure Sockets Layer and is a protocol for protecting communications between SSL-enabled websites and their users. Non-SSL websites utilize the http protocol for data transmission. 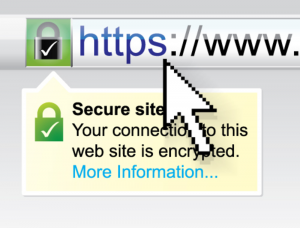 SSL sites utilize https – the ‘s’ stands for ‘secure’. An ‘https’ prefix to a website address means only that submitted data is encrypted – it does not attest to the strength of the encryption nor does it verify that the website is the one it claims to be. Those details are provided by an SSL certificate. These details are read by your web browser; if it deems the certificate to be valid and the site to that which it claims to be, it will bring up the site. If not, the browser will throw a warning to the user. What does an SSL certificate do? Hint – encryption and validation. Basically, an SSL performs two separate functions. The first function is that of encryption, and all certificates perform this function. Simply put, data submitted to a website via a web browser is scrambled (non-technical word for encrypted?) to protect the data. This data might include personal information, credit card details or even login details such as usernames and passwords. All the certificates we offer, from the cheapest (including the Comodo certificates installed for free) to the most expensive, have the same level of encryption strength. The second function of a commercial SSL certificate is that of validation. What it validates, and how this is ascertained is what determines the trust level of the certificate. This, in combination with the number of domains and sub-domains a certificate covers, is what determines the cost of a certificate. You don’t have to have an SSL certificate, but here are three compelling reasons why you should. Remember, if your domains are hosted by HostedSafe, they have SSL Certificates installed automatically, for free. 1) Duty of Care: Sadly, the Wild Wild Web has its share of stealers and tricksters. They make a career of stealing information, often for the purposes of credit card fraud and identity theft. Information transmitted via unencrypted protocols is more easily stolen or manipulated. This information is not limited to credit card details; it also includes submissions to contact forms, opt-in forms and login details. Taking steps to protect your website users’ details is a fair and reasonable behavior. 2) Trust of visitors, users and customers: Because of reason 1), website users are more and more aware of the dangers of unprotected transmission of their private data. Educated users often refuse to disclose information on any website which is not an ‘https’ site. Google’s Chrome browser will more prominently begin to display warnings on websites that are not protected by an SSL certificate. Other browsers will almost certainly follow suit. This will scare users away, for sure. 3) Increased website traffic: This will be a biggie! The biggest search engine, Google, have announced they would like to ultimately see an SSL internet; that is, all websites operating under SSL, and therefore using SSL Certificates, to increase the security of all internet user information. Google says it has already made small adjustments to its algorithms that will immediately give added weight to those websites that are SSL-enabled, but their intention in the medium term is to further increase the advantage to these sites which are covered by an SSL certificate. Https websites will rise to the top of the search results. Websites which are not covered by an SSL certificate will fall further and further behind. What choices do I have if I want a certificate? To buy an SSL Certificate there are two choices to be made. You need to choose the validation level and also the type of certificate as determined by how many domains or sub-domains it will cover. What types of validation are there? There are three levels of validation – Domain Validation (DV), Organization or Business Validation (OV) and Extended Validation (EV). A Domain Validation certificate is the quickest, cheapest and most easily obtained certificate. It is available to anyone who has ownership or control of a website. The validation authority is attesting that the domain covered by the certificate is controlled by the person who purchased the certificate and that encryption is in place. The free SSL Certificate which is installed on all domains hosted by HostedSafe are Domain Validated, which is why they can be installed automatically by cPanel. An Organization Validation (or Business Validation) certificate verifies that the domain is owned by the named business and that the business or organization is a registered entity. Registration documents as provided by a licensing authority (usually a government department) will be required for this validation. The process can take a few days. This validation provides a greatly increased trust level to website users, especially customers of ecommerce businesses. Most certificates in this class provide a seal to website owners to display on their website which shows the business name in the seal. This provides a higher level of assurance to customers. An Extended Validation certificate provides the highest level of trust for website visitors. The major browsers display a green bar and the business name in the browser bar for instant assurance to website visitors. The validation process is extensive and can take a week. For this reason it is more expensive than other validation methods. Banks, financial organizations and ecommerce stores utilize EV certificates as a matter of course. More and more business owners are choosing EV Validation to achieve the maximum trust as displayed by the green bar. How many domains will a certificate cover? Single-domain certificates cover one domain name. With Comodo, this covers both www and non-www on the one certificate. Single-domain certificates are available for all Validation types – Domain, Organization and Extended. Wildcard certificates cover one domain name and sub-domains of that domain. Wildcard certificates are available for Organization Validation certificates. Multi-domain certificates cover many domain names on the one certificate. Sectigo (formerly Comodo CA) Multi-domain certificates cover up to 200 domain names. The base Sectigo Multi-domain certificates include cover for up to 3 domains; cover for additional domains if required can be purchased. Multi-domain certificates are available for Organization and Extended certificates. What SSL certificates does HostedSafe offer? HostedSafe offers a range of SSL certificates for website owners who may require entity validation beyond that offered by a Domain Validation certificate. We have access to a huge range of certificates from various reputable SSL authority vendors. After extensive research and comparisons of effectiveness, trust, value and cost, we have decided to use for ourselves, and offer for sale, certificates from Comodo and GeoTrust. We no longer offer Domain Validated SSL certificates for sale, as they are provided free for all domains hosted with us. There are dozens of different certificates available from many different Certificate Authorities. We have compared the best and chosen only those that we feel will provide the most benefit for the lowest cost. We have compiled a selection of certificates that are designed to help our customers to improve security, trust and sales. Choose from Business Validated, Extended Validation, and Multi-Domain Extended Validation. They all have the same encryption strength. Mostly, the Sectigo (formerly Comodo CA) product is cheaper, but the GeoTrust usually has more benefits. We have found the GeoTrust verification process the easiest to undertake, and their after-sales service very supportive.